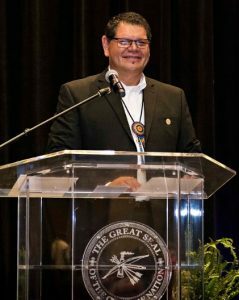 POTEAU, Oklahoma – A Choctaw Nation administrator will be a key presenter at the Eastern Chapter Lunch Meeting of the American Indian Chamber of Commerce of Oklahoma this week. Boyd Miller is the Preferred Supplier Program Commodity Manager with the Choctaw Nation Procurement Department. He served on the AICCO State Board of Directors from 2015 through 2017 and was elected as vice president in 2016 and as president in 2017. Miller will be one of three speakers at the meeting set for 11:30 am-1:00 pm Thursday, August 23 at the Choctaw Nation Dale Cox Community Center, 208 B St. in Poteau. Miller, a graduate of Choctaw University, Durant, is a strong advocate on behalf of the suppliers aspiring to do business with the Choctaw Nation. He received the Minority Advocate of the Year from REI Oklahoma in 2016. Also speaking will be Bailey Walker, Chickasaw Nation Preferred Vendor Program Coordinator, and Edith Baker, Manager for the Contracting and Employment Support Office with Creek Nation in Okmulgee. The public is invited to the luncheon, which will be catered by Giacomo’s Italian Restaurant. Tickets at $20 per person and may be obtained online in advance. Contact http://aiccok.org/ or call American Indian Chamber of Commerce of Oklahoma, 918-624-9382 or email chamber@aiccok.org.